The over-50’s were invited to get to grips with technology and surf the internet with free training at a local library on Friday 18th May for Silver Surfers’ Day. Libraries across the province hosted Silver Surfers’ sessions on Friday 18th, as well as over 50 library branches and other locations across Northern Ireland. To book a Silver Surfers’ session contact your local library. 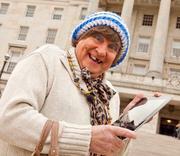 For more information on Silver Surfers’ Day, call Hilary Hanberry on (028) 9046 0606. * Mygroupni is not responsible for the content of external websites.